If I had to name just one tech tool that has completely transformed the way I work, it would have to be Dropbox. But Dropbox only gives you 2GB of free storage (3GB if you jump through some hoops and spam your friends about the service) before you have to pony up $10 a month for an upgrade to 50GB. And I'm way too cheap for that. But with a couple of free downloads, you can get Dropbox-like simplicity in Windows Explorer with Microsoft's free SkyDrive storage service. What makes any given cloud storage tool useful is its integration with the OS. On nearly every platform I can think of, Dropbox has achieved a brilliant level of OS integration so it works just like any other folder on your hard drive. (To the extent that such a thing is possible, anyway.) By itself, Microsoft's SkyDrive is mostly a web-based kludge, requiring you to work through a browser to manage your files. So even though it gives you 12.5 times more free storage than Dropbox, it requires additional tools to make it work well. Fortunately, there are a couple of good options to help you take advantage of SkyDrive. Part of Microsoft's Windows Live Essentials pack, Windows Live Mesh lets you share and sync folders via SkyDrive on Windows and Mac OS X in much the same way as you would with Dropbox. Unfortunately, the Live Essentials version only lets you sync 5GB of your total SkyDrive capacity, which detracts somewhat from its allure. 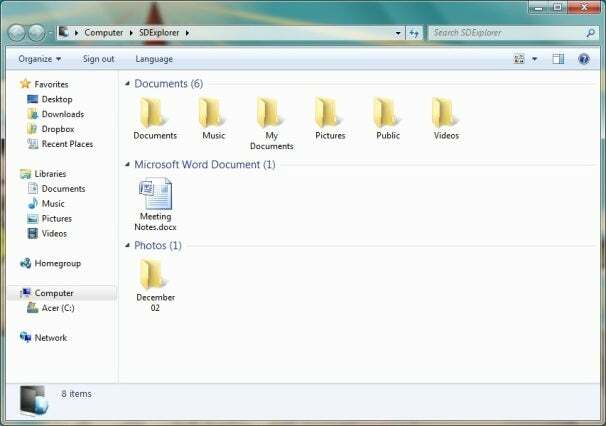 Another tool, SDExplorer, simplifies SkyDrive dramatically, and gives you full access to all of your SkyDrive capacity. SDExplorer comes in two versions: a feature-limited freebie and a robust premium version. The free version imposes limits on the size of files you can upload (50MB or less per file), won't let you move files and folders around within SkyDrive, and won't let you manage folder sharing within the app. The premium version, which runs $14 for a single-PC license and $20 for a multi-PC, single-user license, lifts all these restrictions and adds support for shared managing shared documents in Windows Live Groups. The drawback to SDExplorer is that it doesn't actually sync your SkyDrive folders to your PC. It just gives you access to them over a live Internet connection. Between the two options, I'm partial to SDExplorer, because--for me, at least--SkyDrive's capacity is its primary attraction, and limiting the amount that I can sync renders it relatively uninteresting. Plus, Live Mesh isn't really ready for prime time on the Mac, and I've experienced weird issues getting the Mac version to share the same folder with the latest Windows version (oddly, the older beta version Live Mesh still works fine across both). Overall, however, neither Windows Live Mesh nor SDExplorer really gives you as much multiplatform usability as Dropbox does. While SkyDrive is getting great integration on Windows Phone 7, it remains mostly a browser-based experience on other smartphone platforms, with serious limitations. So, should you dump Dropbox for SkyDrive? It depends. If you live almost exclusively in Windows and don't need much mobile access to your files--or if you use Windows on the desktop and Windows Phone 7--then SkyDrive is a no-brainer. But if, like me, you're constantly moving between various platforms in the course of a day, Dropbox is still the king of cloud storage.